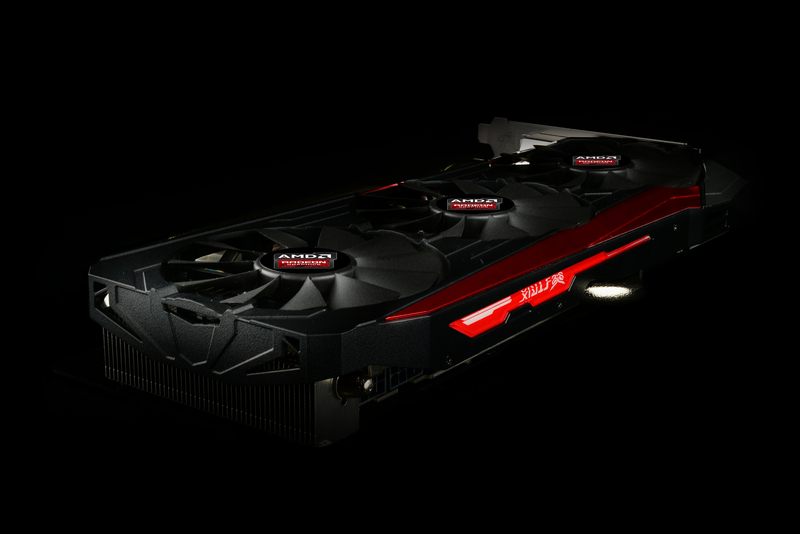 Last month, AMD led the graphics industry into a new era with the launch of the first HBM powered graphics card, the Radeon R9 Fury X. 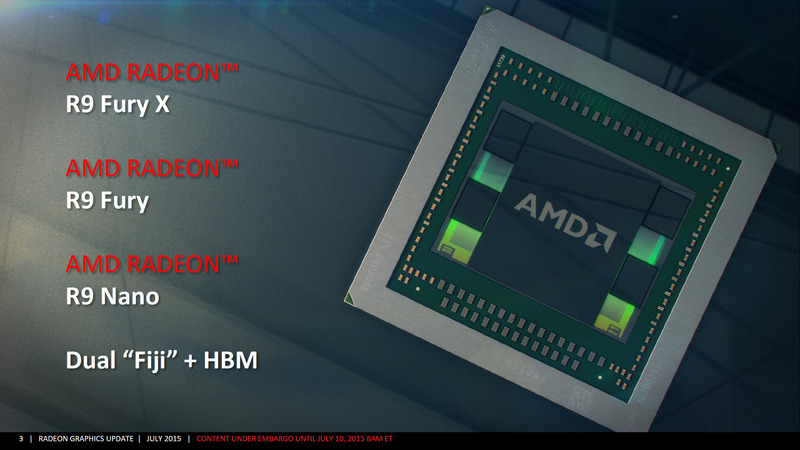 Today, AMD is launching yet another HBM powered graphics card, the Radeon R9 Fury. The Radeon R9 Fury isn’t much different compared to the Radeon R9 Fury X. It is based on the same Fiji GPU, incorporates HBM and features 4K ready performance (as stated by AMD) but unlike the R9 Fury X, it has a $549 US price which is $100 lower than the Fury X and it receives custom variants by AIBs. 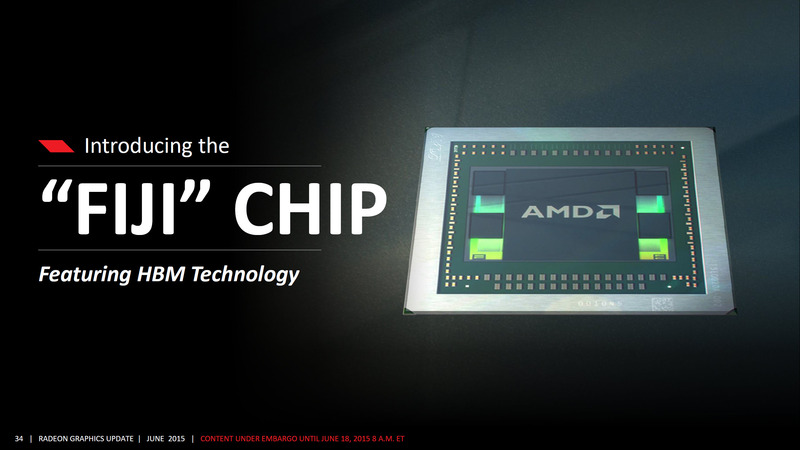 The AMD Fiji GPU is based on a 28nm process and is the single largest chip AMD has ever produced. The chip which measures around 596mm2 has a total of 8.9 Billion transistors crammed under its hood which means a whole lot of performance and the card really does deliver a amazing amount of improvement in performance and efficiency over previous generation GPUs. Compared to Hawaii with its 6.3 billion transistors and 5.6 TFlops of performance, the Fiji GPU crunches out 7.2 TFlops of gpu performance from the depths of its heart. Also comapred to Hawaii, AMD has managed to deliver several Micro architecture improvements along with enhanced power management features and a totally refocused look at board designs. The whole die measures a massive 1011mm2 while the interposer is designed with a 65nm process. The chip may be big but the space it saves from HBM as you’ll learn below transforms graphics cards into smaller and powerful designs. The second great thing about the Fiji GPU is that cards based on the chip are also the first to incorporate the HBM memory standard. High-Bandwidth Memory or HBM in short is the latest memory standard which will be replacing GDDR5 memory in graphics cards soon. 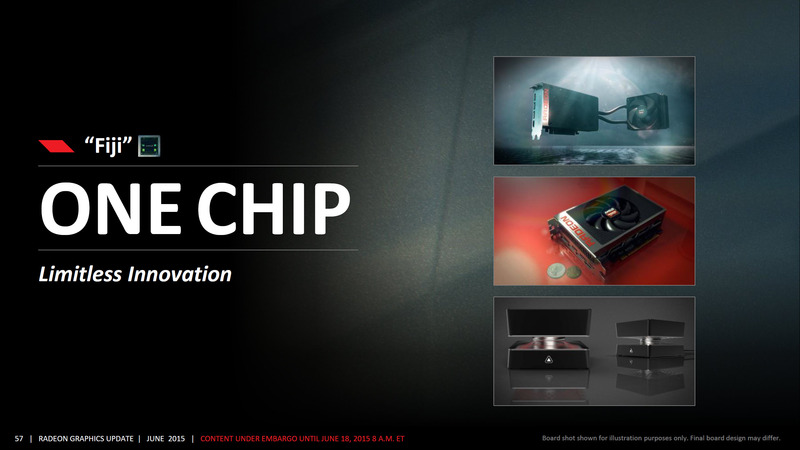 AMD is the first graphics maker to have cards that utilize the new standard out in the market. The HBM 1 chips which are 35mm2 in size are fused on the same package as the GPU die. These chips feature 1 Gbps memory speed and are capable to deliver up to 512 GB/s bandwidth. Each chip has a 1024-bit bus and the great thing about HBM is that it saves massive coverage area compared to GDDR5 chips which leads to interesting PCB designs such as the Radeon R9 Fury X, Radeon R9 Fury, the Radeon R9 Fury X2 and the Radeon R9 Nano. The difference with HBM can be seen in the image below that shows a comparison between the Radeon R9 290X and the Radeon R9 Fury. A Radeon R9 290X has a PCB area, measuring 110x90mm covered by the chip and memory alone. That’s a massive 9900mm2 surface area covered. Compared to the Radeon R9 290X, the Radeon R9 Fury covers just 3025mm2 on the PCB leaving the rest of the area to be better utilized by other technologies such as better electrical components, etc. 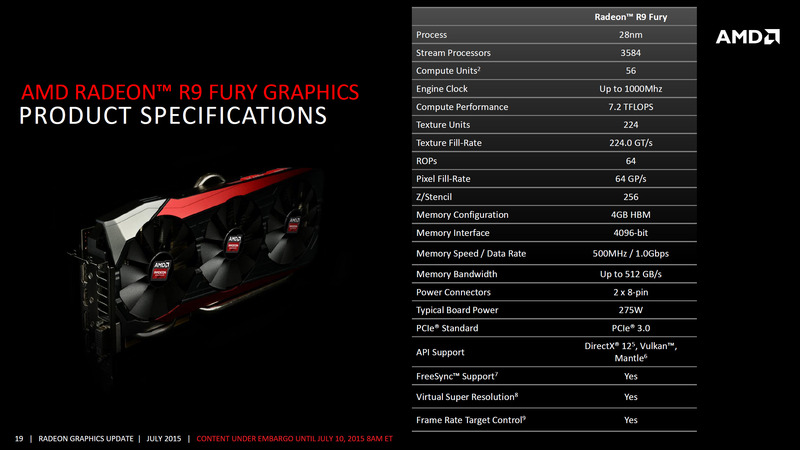 AMD Radeon R9 Fury – The Specifications! The Radeon R9 Fury is the second card to feature the Fiji GPU (Fiji Pro) that is based on a 28nm process. The card has been in talks since the launch of the Fury X and was expected that AMD will definitely release a cut down and cost optimized Fiji based graphics card in the future. The Radeon R9 Fury comes with 54 compute units which pack 64 stream processors each, total of these amount to 3596 stream processors, 64 Raster operation units and 224 texture mapping units. The engine clock for the Radeon R9 Fury is maintained at 1.0 GHz (1000 MHz) which is 50 MHz slower than the Fury X. The texture fill rate is rated at 224.0 GT/s and 64.0 GP/s Pixel Fill rate. The card churns out a total of 7.2 TFlops of compute performance. The card also features 4 GB of HBM VRAM that is clocked at a 500 MHz (1.0 Gbps data rate). The memory runs across a 4096-bit bus interface has has a bandwidth of up to 512 GB/s. The card is powered by dual 8-Pin connectors and has a board power of 275W. Display outputs include HDMI and three DP (Display Port) connectors. There are also custom variants which aren’t bound by to a certain set of display out puts and make use of DVI and extra mini-DP connectors. The card has support for next generation APIs such as DirectX 12 and supports Freesync, VSR and Frame Rate Target Control. The official numbers of the Radeon R9 Fury show that the card is indeed faster than the GeForce GTX 980 at 4K resolution which is what most of us have been expecting. The difference is that the GeForce GTX 980 retails at $499 US compared to $549 US R9 Fury. There are chances that NVIDIA can further reduce pricing on their GTX 980 graphics card but for now the card remains sandwiched between the $429 US Radeon R9 390X and the R9 Fury ($549). From the performance results, we are seeing an average 10 FPS variation in the benchmark slide that is officially posted by AMD however actual reviews may show a different scenario. AMD did showcase the Radeon R9 Fury X as a faster graphics card than the GeForce GTX 980 Ti in their official slides but it turned out to be the opposite when actual reviews hit the web so its advised to check out the reviews which will be posted below soon from various tech websites. 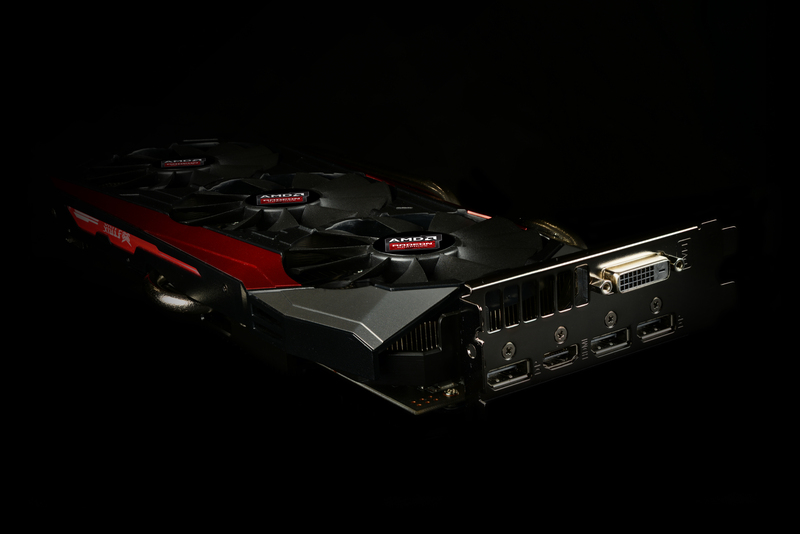 The post AMD Radeon R9 Fury With Fiji Pro GPU Officially Launched – 4K Ready Performance, Beats The 980 But For $50 More At $549 US by Hassan Mujtaba appeared first on WCCFtech.